The lowest cost heavy duty automatic hot knife cutting machine for cargo slings and safety harness webbing available on the market today. 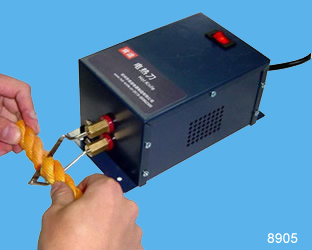 The temperature of hot blade is upto 600 C, can cut all types synthetic webbing straps made of Nylon, Polyester and Polypropylene;Temperature, cutting length, production quantity, cutting time all programmable; Cut and seal the material in same time for simple future processing; Top and bottom feed mechanism ensures precise cutting length; With CE certificate (CE approved). Application: Ratchet straps, lashing straps & tie downs, safety belts, fall protection equipment & safety harness, rescue belts, safety lanyard, military webbing straps, seat belts, lifting slings, lifting straps, crane slings, rigging slings. 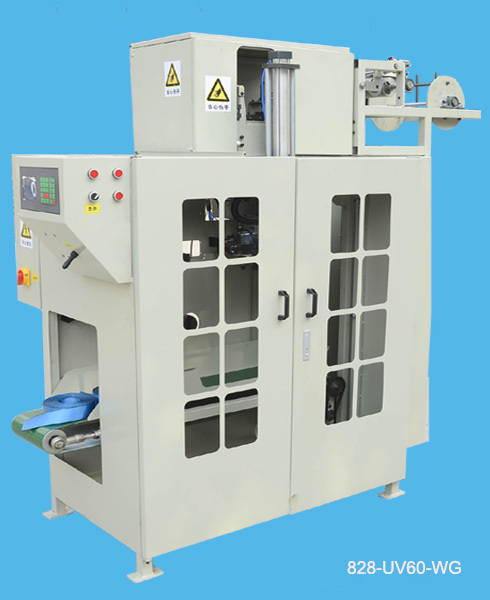 Most hot knife webbing cutting machines in today market are designed for light weight webbing tapes for straps and belts used in fashion industry. 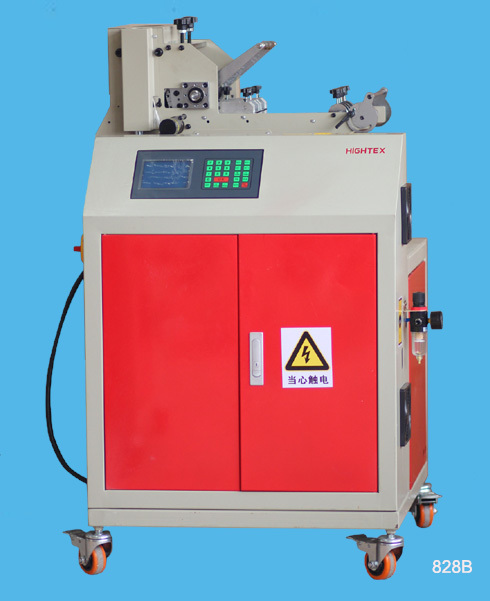 Hightex 828A is a professional hot cutting machine for heavy duty synthetic straps, belts, harnesses and Webbing; Excellent price/performance ratio; Cut and seal the material in same time for simple future processing; Top and bottom feed mechanism ensures precise cutting length; With CE certificate (CE approved). 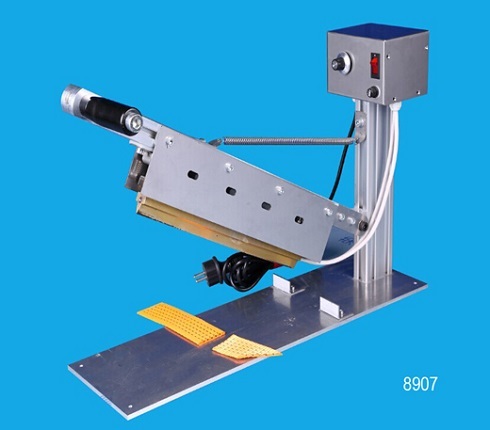 This heavy duty automated webbing hot cutting machine is same to 828A, but equipped with 2 blades, greatly improve cutting efficiency, and prevent from burrs. 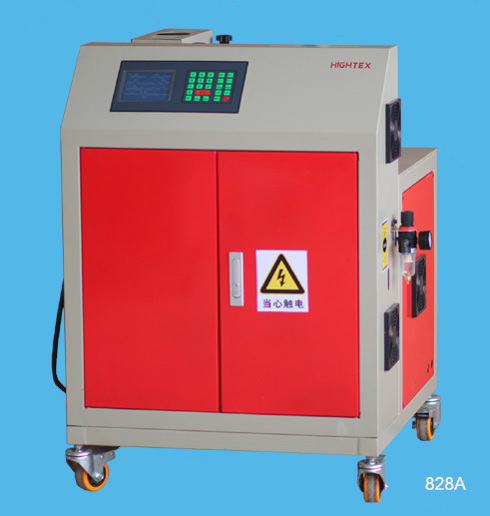 Hightex 828B is a professional hot knife cutting machine for both heavy duty lifting slings and straps, as well as cargo lashing straps and safety harness webbing; Excellent price/performance ratio; Cut and seal the material in same time for simple future processing; Top and bottom feed mechanism ensures precise cutting length; With CE certificate (CE approved). This unique hot cutting machine is designed for automatic cutting, measuring and sealing 10,000kg webbing sling (300mm wide) in the production of 10,000 KGS (10T) extra heavy duty lifting slings and wide body cargo slings made of Nylon and Polyester. 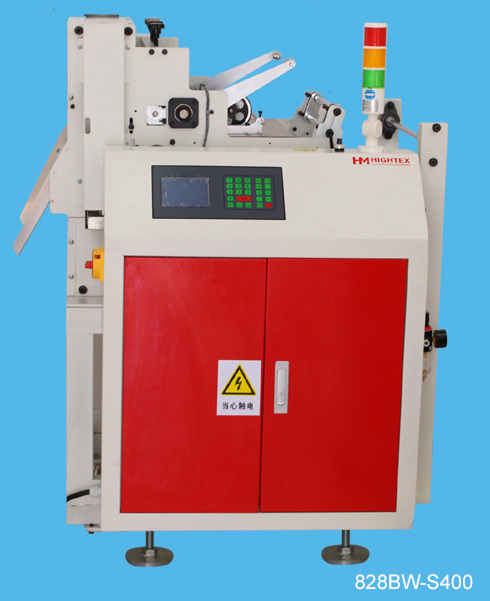 Most hot knife webbing cutting machines in today market are designed for light weight webbing tapes for straps and belts used in fashion industry. 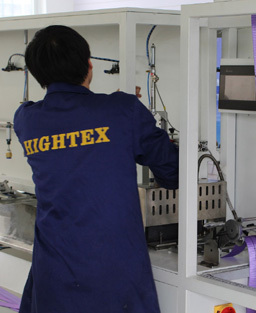 Hightex 828C is a professional hot cutting machine for heavy duty synthetic straps, belts, harnesses and Webbing; Excellent price/performance ratio; Cut and seal the material in same time for simple future processing; Top and bottom feed mechanism ensures precise cutting length; With CE certificate (CE approved). Application: fall protection equipment & safety harness, seat belts, heavy duty lifting slings, lifting straps, crane slings, rigging slings, army webbing, military equipment and other industrial lifting belts, ratchet straps, lashing straps, safety belts, rescue belts, safety lanyard, military webbing straps. 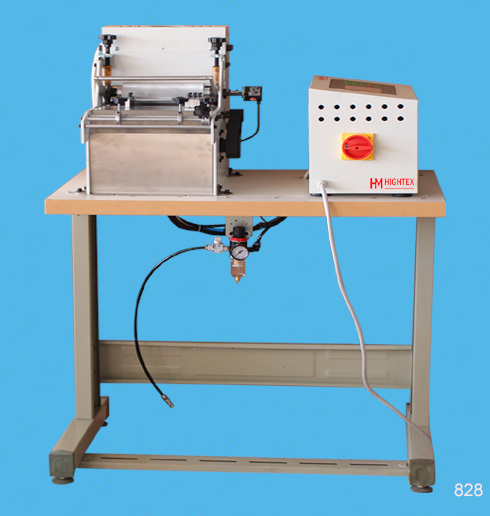 828BM-E300 is highly efficient hot knife automatic webbing cutting machines, especially designed for the lifting slings, lashing strap and safety harness industries. They feature an easy-to-adjust marking system that simultaneously adds up to six ink marks to the webbing straps that then becomes the reference for proper placement and sewing on lifting slings, cargo lashing strap and safety harness. The length for cutting and the position of the reference marks for sewing in the subsequent making process can be programmed into the controller. The machine automatically cuts the webbing strap and marks their position for subsequent sewing. The HIGHTEX 828-UV60-WG is designed as a flexible and automatic cutting, measuring and winding system for a wide range of applications, such as cargo lashing straps and harness webbing. Its flexibility fits well to the requirements of various cutting and winding applications and also covers a wide range of winding dimensions up to roll or bobbin diameter of 300 mm. Based on many years of experience in the design of winding, cutting and confection machines, the 828-UV60-WG obtains a high process reliability and avoids typical textile problems, such as knots, roll and bobbin deformation, tension variations, loops or distortion; With CE certificate (CE approved). 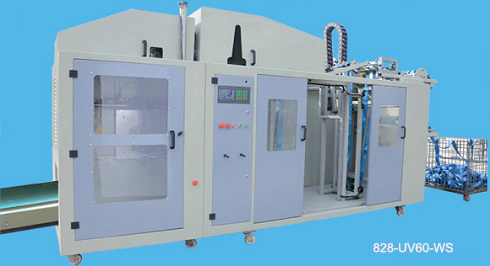 Same with 828-UV60-WG automatic length cutting and winding machine, but with automatic packing /wrapping system to realize fully automation (from measure, cut, wind to pack finished product, without worker involve in). HIGHTEX 828-UV60-WS is designed as a flexible and fully automatic cutting and winding system for a wide range of applications, such as cargo lashing straps and harness webbing. Its flexibility fits well to the requirements of various cutting and winding applications and also covers a wide range of winding dimensions up to roll or bobbin diameter of 300 mm. Based on many years of experience in the design of winding, cutting and confection machines, the 828-UV60 obtains a high process reliability and avoids typical textile problems, such as knots, roll and bobbin deformation, tension variations, loops or distortion; With CE certificate (CE approved). 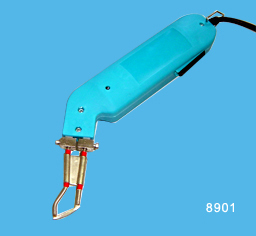 It is industrial grade heat cutting equipment to cut and seal synthetic materials to prevent fraying. The heavy-duty construction is suitable for most hot knife applications and materials up to 3/4" (20mm) thick in the manufacturing of slings, ropes and heavy webbing. The long-arm gives plenty of workspace and versatility. Special bracket is available as option for cutting multiple layers of webbing together. The extra long hot knife is suitable for cutting webbing slings, lashing straps, seat belts and other synthetic materials up to 300mm wide. Applications: synthetic lifting slings, cargo lashing straps, Ratchet Tie Down, seat belts, safety harness, military webbing, crane slings, lanyards, spanzet, safety belts, ropes and cordage for Arborist climbing ropes, Climbing & Caving Ropes, Boating & Marine Ropes and Rescue Ropes. 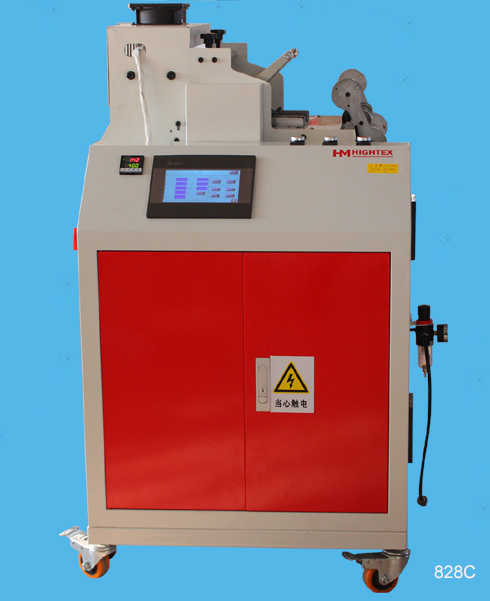 This type thermal cutting machine is possible to cut synthetic fabric, such as belts, bands and ropes to length. An electric heated blade separates, in one phase of operation, the material by heat and seals the cut edges to avoid fringing of the cut edge.